Update 9/24/18: ACLU attorneys met with Greyhound to educate them on their 4th Amendment Right to refuse searches without a warrant or probable cause. But they're still letting CBP board their buses. We'll deliver this petition soon to show Greyhound the cost of being complicit in the Trump administration’s deportation machine. We need as many signatures as possible – add your name now. For over a year, the Trump administration has unleashed a cruel and unconstitutional assault on immigrants – and it's not slowing down. From detaining asylum seekers to separating families at the border, the message is clear: Immigrants are not welcome here. The latest development might make you think twice about taking a Greyhound bus. The company is allowing Border Patrol agents to board its buses and question and arrest passengers without a warrant or any suspicion of wrongdoing. That's what you're signing up for when you purchase a Greyhound ticket. Imagine taking your regular bus to work or school. The bus pulls over and Border Patrol agents get on board. Row by row, they scan passengers for anybody deemed "suspicious" due to the color of their skin, accent, or the way they dress. They demand proof of citizenship. 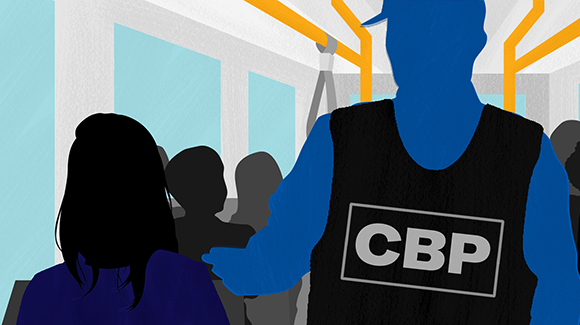 You think you're just taking the bus home, like any other day – but you end up arrested, detained, and in worst cases, deported. Throughout the country, families and working people rely on companies like Greyhound every day. Greyhound must not throw its loyal customers under the bus as part of Trump's racist, anti-immigrant agenda. It's unconstitutional, unfounded, and just plain wrong. What Greyhound and its passengers need to know is that there is NO legal requirement for the company to let Border Patrol board its buses. The Fourth Amendment prohibits government agents from entering private property without consent or a warrant, and it protects everyone on U.S. soil – regardless of citizenship – from being detained or searched without cause. By law, Greyhound is fully capable of saying NO to Border Patrol. So why aren't they? Sign this petition telling Greyhound stop letting Border Patrol violate its passengers' constitutional rights. It's not only the right thing to do – it's the law. Stop violating your passengers' constitutional rights by allowing Border Patrol agents to board your buses, question and arrest them. People should be able to take the bus without fear of unfounded interrogation and deportation. Your company has the right to say no to Border Patrol – now is the time to do it.